A glycogen storage disease (GSD) is the result of an enzyme defect. These enzymes normally catalyze reactions that ultimately convert glycogen compounds to glucose. Enzyme deficiency results in glycogen accumulation in tissues. In many cases, the defect has systemic consequences, but in some cases, the defect is limited to specific tissues. Most patients experience muscle symptoms, such as weakness and cramps, although certain GSDs manifest as specific syndromes, such as hypoglycemic seizures or cardiomegaly. Although at least 14 unique GSDs are discussed in the literature, the 4 that cause clinically significant muscle weakness are Pompe disease (GSD type II, acid maltase deficiency), Cori disease (GSD type III, debranching enzyme deficiency), McArdle disease (GSD type V, myophosphorylase deficiency), and Tarui disease (GSD type VII, phosphofructokinase deficiency). One form, von Gierke disease (GSD type Ia, glucose-6-phosphatase deficiency), causes clinically significant end-organ disease with significant morbidity. The remaining GSDs are not benign but are less clinically significant; therefore, the physician should consider the aforementioned GSDs when initially entertaining the diagnosis of a GSD. Interestingly, GSD type 0 also is described and is a disorder causing glycogen deficiency due to defective glycogen synthase. Diagnosis depends on findings from patient history and physical examination, creatine kinase testing, muscle biopsy, electromyelography, and ischemic forearm testing. Biochemical assay for enzyme activity is the method of definitive diagnosis. Myophosphorylase, the deficient enzyme in McArdle disease, is found in muscle tissue. Myophosphorylase deficiency causes muscle cramps, pain, and stiffness. One hallmark of McArdle disease is weakness with exertion. Proximal muscle weakness may progress with time, and no specific treatment exists. To study the role of fat metabolism in GSD type V, Andersen et al manipulated the availability of free fatty acid for oxidation during exercise in 10 patients with the disease. The patients, who cycled at a constant workload corresponding to 70% of their maximum oxygen consumption, received either nicotinic acid or 20% Intralipid infusion, which, respectively, reduced or increased free fatty acid availability. Comparing their trial results with those of placebo and glucose infusion studies, the authors concluded that although during exercise lipids are an important fuel source in persons with GSD type V, maximal fat oxidation rates during exercise cannot be raised above physiologically normal rates in these patients. 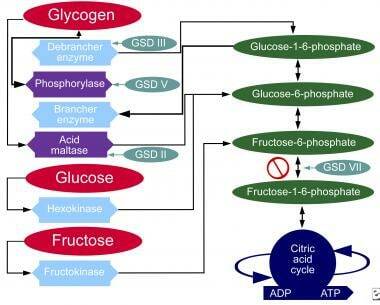 Andersen et al suggested that this limitation results from glycolytic flux impairment, which causes a "metabolic bottleneck" in the tricarboxylic acid cycle. Fatty acids and glucose serve as substrates for energy production. With intense exercise, glucose from glycogen stores in muscle becomes the predominant resource. Fatigue develops when the glycogen supply is exhausted. [3, 4] Each GSD represents a specific enzyme defect, and each enzyme is in specific, or most, body tissues. Myophosphorylase is found in muscle. Hypoglycemia is not an expected finding because liver phosphorylase is not involved. Immediate morbidity arises from severe exercise intolerance. In general, GSDs present in childhood. Later onset correlates with a less severe form. Consider Pompe disease if onset is in infancy. The majority of patients with McArdle disease present in the second to third decade of life. Duno M, Quinlivan R, Vissing J, et al. High-resolution melting facilitates mutation screening of PYGM in patients with McArdle disease. Ann Hum Genet. 2009 May. 73:292-7. [Medline]. Andersen ST, Jeppesen TD, Taivassalo T, et al. Effect of changes in fat availability on exercise capacity in McArdle disease. Arch Neurol. 2009 Jun. 66(6):762-6. [Medline]. Kemp GJ, Tonon C, Malucelli E, et al. Cytosolic pH buffering during exercise and recovery in skeletal muscle of patients with McArdle's disease. Eur J Appl Physiol. 2009 Mar. 105(5):687-94. [Medline]. Quinlivan R, Vissing J, Hilton-Jones D, Buckley J. Physical training for McArdle disease. Cochrane Database Syst Rev. 2011 Dec 7. 12:CD007931. [Medline]. Wolfe GI, Baker NS, Haller RG. McArdle's disease presenting with asymmetric, late-onset arm weakness. Muscle Nerve. 2000 Apr. 23(4):641-5. [Medline]. Felice KJ, Schneebaum AB, Jones HR Jr. McArdle's disease with late-onset symptoms: case report and review of the literature. J Neurol Neurosurg Psychiatry. 1992 May. 55(5):407-8. [Medline]. Pourmand R, Sanders DB, Corwin HM. Late-onset Mcardle''s disease with unusual electromyographic findings. Arch Neurol. 1983 Jun. 40(6):374-7. [Medline]. Quinlivan R, Buckley J, James M, Twist A, Ball S, Duno M, et al. McArdle disease: a clinical review. J Neurol Neurosurg Psychiatry. 2010 Nov. 81(11):1182-8. [Medline]. Orngreen MC, Jeppesen TD, Andersen ST, et al. Fat metabolism during exercise in patients with McArdle disease. Neurology. 2009 Feb 24. 72(8):718-24. [Medline]. Kitaoka Y. McArdle Disease and Exercise Physiology. Biology (Basel). 2014 Feb 25. 3(1):157-66. [Medline]. [Full Text]. Braakhekke JP, de Bruin MI, Stegeman DF. The second wind phenomenon in McArdle's disease. Brain. 109 (Pt 6):1087-101. [Medline]. Voduc N, Webb KA, D'Arsigny C, et al. McArdle's disease presenting as unexplained dyspnea in a young woman. Can Respir J. 2004 Mar. 11(2):163-7. [Medline]. Pillarisetti J, Ahmed A. McArdle disease presenting as acute renal failure. South Med J. 2007 Mar. 100(3):313-6. [Medline]. Bruno C, Bertini E, Santorelli FM. HyperCKemia as the only sign of McArdle''s disease in a child. J Child Neurol. 2000 Feb. 15(2):137-8. [Medline]. Felice KJ, Grunnet ML, Sima AA. Selective atrophy of type 1 muscle fibers in McArdle's disease. Neurology. 1996 Aug. 47(2):581-3. [Medline]. Andersen ST, Vissing J. Carbohydrate- and protein-rich diets in McArdle disease: effects on exercise capacity. J Neurol Neurosurg Psychiatry. 2008 Dec. 79(12):1359-63. [Medline]. Day TJ, Mastaglia FL. Depot-glucagon in the treatment of McArdle''s disease. Aust N Z J Med. 1985 Dec. 15(6):748-50. [Medline]. Bollig G. McArdle's disease (glycogen storage disease type V) and anesthesia--a case report and review of the literature. Paediatr Anaesth. 2013 Sep. 23(9):817-23. [Medline]. Chiado-Piat L, Mongini T, Doriguzzi C. Clinical spectrum of McArdle disease: three cases with unusual expression. Eur Neurol. 1993. 33(3):208-11. [Medline]. Chui LA, Munsat TL. Dominant inheritance of McArdle syndrome. Arch Neurol. 1976 Sep. 33(9):636-41. [Medline]. Isackson PJ, Tarnopolsky M, Vladutiu GD. A novel mutation in the PYGM gene in a family with pseudo-dominant transmission of McArdle disease. Mol Genet Metab. 2005 Jul. 85(3):239-42. [Medline]. Martin MA, Rubio JC, Campos Y. Two homozygous mutations (R193W and 794/795 delAA) in the myophosphorylase gene in a patient with McArdle's disease. Hum Mutat (Online). 2000 Mar. 15(3):294. [Medline]. O'Dochartaigh CS, Ong HY, Lovell SM, et al. Oxygen consumption is increased relative to work rate in patients with McArdle's disease. Eur J Clin Invest. 2004 Nov. 34(11):731-7. [Medline]. Quintans B, Sanchez-Andrade A, Teijeira S, Fernandez-Hojas R, Rivas E, López MJ. A new rare mutation (691delCC/insAAA) in exon 17 of the PYGM gene causing McArdle disease. Arch Neurol. 2004 Jul. 61(7):1108-10. [Medline].